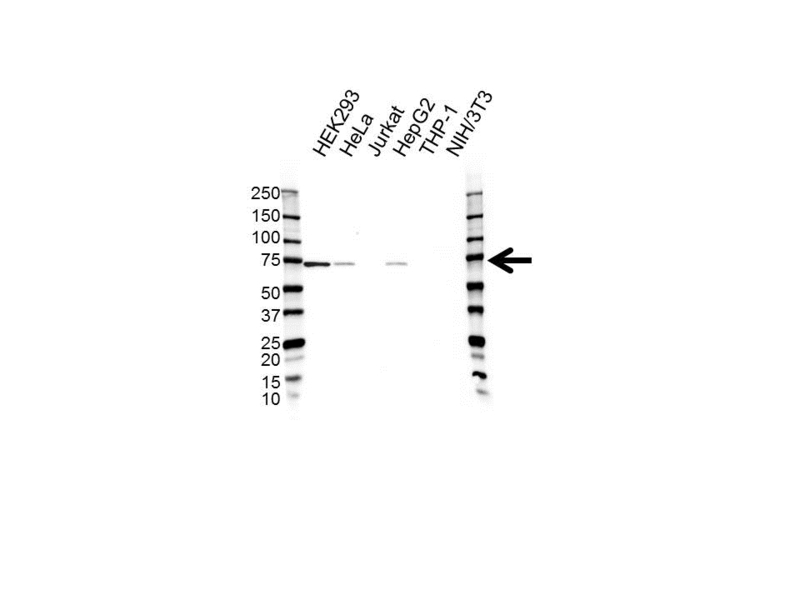 Rabbit anti Human pokemon antibody recognizes the zinc finger and BTB domain-containing protein 7A, also known as HIV-1 inducer of short transcripts binding protein, POZ and Krueppel erythroid myeloid ontogenic factor, TTF-I-interacting peptide 21 (TIP21), LRF or zinc finger protein 857A. Based on its similarity to other proteins Zinc finger and BTB domain-containing, the protein encoded by ZBTB7A is believed to play a key role in the instruction of early lymphoid progenitors to develop into B lineage by repressing T-cell instructive Notch signals and/or to efficiently abrogate E2F1-dependent CDKN2A transactivation/de-repression. Expressed in medullary epithelial cells and Hassle's corpuscles in WT thymus and in the squamous epithelium as well as the germinal center lymphocytes in tonsils. The product of ZBTB7A is up-regulated in a subset of lymphomas, as well as in a subset of breast, lung, colon, prostate and bladder carcinomas (at protein level). ZBTB7A has been shown to interact with BCL6. Rabbit anti Human pokemon antibody detects a band of 75 kDa. The antibody has been extensively validated for western blotting using whole cell lysates.